Not to be confused with DragonFly (capsule). Dragonfly is a proposed spacecraft and mission that would send a mobile robotic rotorcraft lander to Titan, the largest moon of Saturn, in order to study prebiotic chemistry and extraterrestrial habitability at various locations where it would perform vertical-takeoff and landings (VTOL). Titan is unique in having an abundant, complex, and diverse carbon-rich chemistry on the surface of a water-ice-dominated world with an interior water ocean, making it a high-priority target for astrobiology and origin of life studies. The mission was proposed in April 2017 to NASA's New Frontiers program by the Johns Hopkins Applied Physics Laboratory, and it was selected as one of two finalists (out of twelve proposals) in December 2017 to further refine the mission's concept. Dragonfly is a proposal for an astrobiology mission to Titan to assess its microbial habitability and study its prebiotic chemistry at various locations. If selected for launch, Dragonfly would perform controlled flights and vertical takeoffs and landings between locations, while powered by a radioisotope thermoelectric generator (RTG). The mission would involve flights to multiple different locations on the surface, which allows sampling diverse regions and geological contexts. 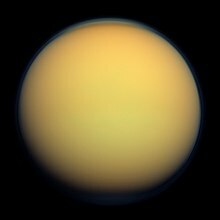 Titan is a compelling astrobiology target because its surface contains abundant complex carbon-rich chemistry and because both liquid water and liquid hydrocarbons can occur on its surface, possibly forming a prebiotic primordial soup. The initial Dragonfly conception took place over a dinner conversation between scientists Jason W. Barnes (Department of Physics, University of Idaho) and Ralph D. Lorenz (Johns Hopkins University Applied Physics Laboratory) and it took 15 months to make it a detailed mission proposal. The Principal Investigator is Elizabeth Turtle, a planetary scientist at the Johns Hopkins University Applied Physics Laboratory. The Dragonfly mission concept builds on several earlier studies of Titan mobile aerial exploration, including the 2007 Titan Explorer Flagship study, which advocated a Montgolfière balloon for regional exploration, and AVIATR, an airplane concept considered for the Discovery program. The concept of a rotorcraft lander that flew on battery power, recharged during the 8-Earth-day Titan night from a radioisotope power source, was proposed by Lorenz in 2000. More recent discussion has included 2014 Titan rotorcraft study by Larry Matthies, at the Jet Propulsion Laboratory, that would have a small rotorcraft deployed from a lander or a balloon. The hot-air balloon concepts would have used the heat from a radioisotope thermoelectric generator (RTG). Leveraging proven rotorcraft systems and technologies, Dragonfly would use a multi-rotor vehicle to transport its instrument suite to multiple locations to make measurements of surface composition, atmospheric conditions, and geologic processes. NASA plans to select one of two proposals (Dragonfly or CAESAR) in July 2019 to build and launch in 2024 or 2025 as the New Frontiers program Mission 4. The CAESAR and Dragonfly missions received $4 million (USD) funding each through the end of 2018 to further develop and mature their concepts. NASA plans to select one of these two proposals in July 2019 to build and launch in 2024 or 2025. The selected mission will be the fourth in NASA's New Frontiers portfolio, a series of principal investigator-led planetary science investigations that fall under a development cost cap of approximately $850 million. The Penn State Vertical Lift Research Center of Excellence is responsible for rotor design and analysis, rotorcraft flight-control development, scaled rotorcraft testbed development, ground testing support, and flight performance assessment. In 2005, the European Space Agency's Huygens lander acquired some atmospheric and surface measurements on Titan. It detected tholins, which are a mix of hydrocarbons (organic compounds) in the atmosphere and on the surface. Because Titan's atmosphere obscures the surface at many wavelengths, the specific compositions of solid hydrocarbon materials on Titan's surface remain essentially unknown. Measuring the compositions of materials in different geologic settings will reveal how far prebiotic chemistry has progressed in environments that provide known key ingredients for life, such as pyrimidines (bases used to encode information in DNA) and amino acids, the building blocks of proteins. Areas of particular interest are sites where extraterrestrial liquid water in impact melt or potential cryovolcanic flows may have interacted with the abundant organic compounds. Dragonfly would provide the capability to explore diverse locations to characterize the habitability of Titan's environment, investigate how far prebiotic chemistry has progressed, and search for biosignatures indicative of life based on water as solvent and even hypothetical types of biochemistry. The atmosphere contains plentiful nitrogen and methane, and strong evidence indicates that liquid methane exists on the surface. Evidence also indicates the presence of liquid water and ammonia under the surface, which may be delivered to the surface by cryovolcanic activity. Dragonfly would be a rotorcraft lander, much like a large quadcopter with double rotors, an octocopter. Such redundant rotor configuration would be able to tolerate the loss of at least one rotor or motor. Each of the eight rotors would be about 1 m in diameter. The aircraft would travel at about 10 m/s or 36 km/h and climbs up to 4 km altitude would be desired for best scientific value. Aerial flight on Titan is aerodynamically benign as Titan has low gravity, low winds, and its thick atmosphere allows for efficient rotor propulsion. The RTG power source has been proven in multiple spacecraft, and the extensive use of quad drones on Earth provides a well-understood flight system that is being complemented with algorithms for independent actions in real time. The craft will be designed to operate under space radiation and temperatures averaging 94 K (−179.2 °C; −290.5 °F). The power required to hover a given mass on Titan is 38 times less than that required on Earth, due to Titan's denser atmosphere and lower gravity. The atmosphere is about four times as thick as Earth's, but local gravity (15 percent of Earth's) would make it easier to fly, although cold temperatures and lower light must be contended with. The rotorcraft could travel significant distances, powered by a battery that would be recharged by a Multi-Mission Radioisotope Thermoelectric Generator (MMRTG) during the night. MMRTGs convert the heat from the natural decay of a radioisotope into electricity, although increased mass and surface area might sacrifice control. The rotorcraft would be able to travel tens of kilometers on every battery charge and stay aloft for a few hours each time. The vehicle would use sensors to scout new science targets, returning to the original site until new landing locations are verified as safe by mission controllers. Preliminary studies and modeling contemplate a baseline 450 kg (990 lb) mass for the rotorcraft packed in a 3.7 m diameter heatshield. Samples would be obtained by two sample acquisition drills and hoses, one on each landing skid, for delivery to the mass spectrometer instrument. The craft would remain on the ground during the Titan nights, which last about 8 Earth days or 192 hours. Activities during the night would include sample collection and analysis, seismological studies, meteorological monitoring, and local microscopic imaging using LED illuminators as flown on Phoenix lander and Curiosity rover. The craft will communicate directly to Earth with a high-gain antenna. 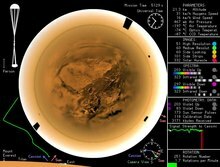 DragonCam (Dragonfly Camera Suite) are a set of microscopic and panoramic cameras to image Titan's terrain and scout for scientifically interesting landing sites. ^ a b c d e f g h i j k l m n o Dragonfly: A Rotorcraft Lander Concept for Scientific Exploration at Titan (PDF). Ralph D. Lorenz, Elizabeth P. Turtle, Jason W. Barnes, Melissa G. Trainer, Douglas S. Adams, Kenneth E. Hibbard, Colin Z. Sheldon, Kris Zacny, Patrick N. Peplowski, David J. Lawrence, Michael A. Ravine, Timothy G. McGee, Kristin S. Sotzen, Shannon M. MacKenzie, Jack W. Langelaan, Sven Schmitz, Larry S. Wolfarth, and Peter D. Bedini. Johns Hopkins APL Technical Digest, 34(3), 374-387. ^ a b c "Eyes on Titan: Dragonfly Team Shapes Science Instrument Payload". Johns Hopkins University Applied Physics Laboratory. 9 January 2019. Retrieved 15 March 2019. ^ a b c d e Dragonfly: Exploring Titan's Prebiotic Organic Chemistry and Habitability (PDF). E. P. Turtle, J. W. Barnes, M. G. Trainer, R. D. Lorenz, S. M. MacKenzie, K. E. Hibbard, D. Adams, P. Bedini, J. W. Langelaan, K. Zacny, and the Dragonfly Team. Lunar and Planetary Science Conference 2017. ^ "Dragonfly: Titan Rotorcraft Lander". The Johns Hopkins University Applied Physics Laboratory. 2017. Retrieved 2017-09-20. ^ Redd, Nola Taylor (25 April 2017). "'Dragonfly' Drone Could Explore Saturn Moon Titan". Space. Retrieved 2017-09-20. ^ "NASA Invests in Concept Development for Missions to Comet, Saturn Moon Titan | News - NASA Solar System Exploration". NASA Solar System Exploration. Retrieved 2017-12-20. ^ "Dragonfly And CAESAR: NASA Greenlights Concepts For Missions To Titan And Comet 67P/Churyumov-Gerasimenko". Science 2.0. 2017-12-20. Retrieved 2017-12-22. ^ a b NASA Selects Johns Hopkins APL-Led Mission to Titan for Further Development. Johns Hopkins Applied Physics Laboratory - Press release. 21 December 2017. ^ Dragonfly: Exploring Titan's Surface with a New Frontiers Relocatable Lander. American Astronomical Society, DPS meeting #49, id.219.02. October 2017. ^ Titan Explorer - Flagship Study (PDF). NASA and APL. January 2008. ^ Post-Cassini Exploration of Titan: Science Rationale and Mission Concepts PDF). R. Lorenz, Journal of the British Interplanetary Society, 2000, Vol. 53, pages 218-234. ^ NIAC Phase 1 Final Study Report on Titan Aerial Daughtercraft. (PDF)Larry Matthies. NASA/JPL. 2014. ^ a b Montgolfiere Aerobots for Titan (PDF). Jack A. Jones and Jiunn Jenq Wu. NASA's Jet Propulsion Laboratory. ^ a b Spacewatch: out-of-this-world drone with a Titanic task ahead The Guardian, 2017-12-21. ^ a b c Finalists in NASA's Spacecraft Sweepstakes: A Drone on Titan, and a Comet-Chaser. Kenneth Chang, The New York Times. 20 November 2017. ^ Aerospace engineers developing drone for NASA concept mission to Titan. Chris Spallino, PhysOrg. 10 January 2018. ^ Sarah Hörst "What in the world(s) are tholins? ", Planetary Society, July 23, 2015. Retrieved 30 Nov 2016. ^ "Tropical Methane Lakes on Saturn's Moon Titan". saturntoday.com. 2012. Retrieved June 16, 2012. ^ Dragonfly Proposed to NASA as Daring New Frontiers Mission to Titan. Matt Williams, Universe Today. 25 August 2017. ^ a b c Turtle, Elizabeth P. (2019). "The Dragonfly Mission to Titan: Exploration of an Ocean World". JHU Applied Physics Laboratory. Retrieved 9 March 2019. ^ Post-Cassini Exploration of Titan: Science Rationale and Mission Concepts (PDF). R. Lorenz, Journal of the British Interplanetary Society, 2000, Vol. 53, pages 218-234.